Much Ado About Nothing may be my favorite Shakespearean comedy. For starters, I can’t resist a literary love-hate relationship, and Beatrice and Benedick are the ultimate. Then there’s the wordplay, which is just as much fun today as it was at the turn of the 17th century. True, some of the homonyms are lost in translation because pronunciation has changed, but plenty remain even now. The Complete Much Ado About Nothing: An Annotated Edition of the Shakespeare Play by Donald J. Richardson was a great edition for adding historical context and explaining some of the wordplay that might be missed with a modern reading. But why stop with one reading and miss the chance to nerd out, Shakespeare style? There are a few film versions worth watching. The classic 1993 film version directed by Kenneth Branagh is still beautiful and captures the sunny Italian countryside in all its glory. Emma Thompson is probably my favorite Beatrice, and the verbal sparring between her character and Kenneth Branagh’s Benedick (Thompson’s then-husband) is as sparkling as their surroundings. This version is basically the ne plus ultra of Shakespeare adaptations featuring flowy costumes, pretty faces, and magnificent Tuscan scenery. No big disappointments, no big surprises. The cast of Kenneth Branagh's 1993 film version, replete with flowing sleeves and bonus Baby Kate Beckinsale! Emma Thompson and Kenneth Branagh as Beatrice and Benedick. Sybill Trelawney was hot, y'all. Joss Whedon’s 2012 version is a unique take. Shot in black and white at his home over the course of a long weekend, with a cast of familiar faces for anyone who is a fan of his other work (Buffy 4EVER! ), it channels the manic energy of a classic screwball comedy fueled with plenty of martinis. Amy Acker and Alexis Denisof as Beatrice and Benedick have an effortless chemistry that speaks of a personal history hinted at in the text. Nathan Fillion’s Dogberry is a standout, too -- maybe my favorite version of the character, although this is not my favorite version of the play. In which Joss Whedon's swimming pool is forever immortalized. Amy Acker and Alexis Denisof reunited as Beatrice and Benedick. Be still my heart. I’ll admit it -- I’m a bit of a purist and find that modern settings often take me out of the story. There are few performers who can insert Shakespearean lines into a contemporary setting while making it seem effortless and unaffected. 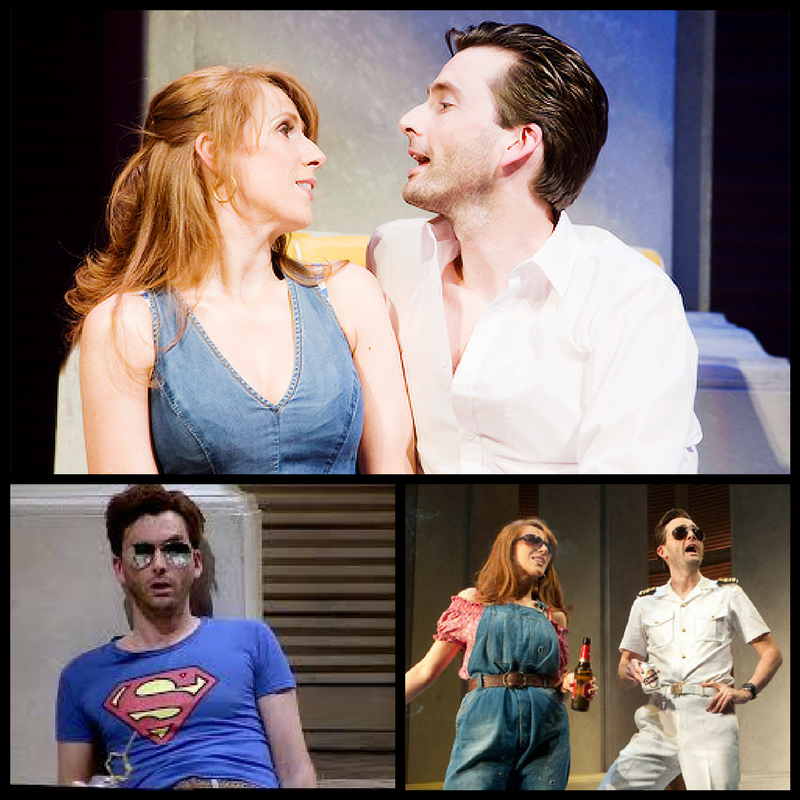 David Tennant is one of the exceptional few, and it’s his performance as Benedick that anchors the Wyndham Theatre’s 2011 production directed by Josie Rourke. Catherine Tate makes a buoyantly fun Beatrice, too. It’s worth watching for the pairing of Tennant-Tate and for his outstanding performance. Just don’t expect a proper film with great production values -- it’s the filming of a play. Rourke's version is set in 1980s Gibraltar. Yes, you read that right. Getting to see a live production of the play was the true highlight of my Fantastical Banquet endeavor, especially because I got to see it at the American Shakespeare Center in charming Staunton, VA. American Shakespeare Center’s Blackfriars Playhouse is a replica of the Jacobean theatre which burned in the Great Fire of London in 1666. But the setting is only part of the magic -- the company also uses Shakespearean staging practices that turn any sense of stodginess you might associate with his plays on its head. The universal lighting, brisk pace, and the way characters come and go from one scene to the next with no break brought an electric energy and sense of fun to the whole production. If you’ve ever wondered why Shakespeare’s works are still performed 400 years later, see one performed at ASC and wonder no more. If you still haven’t gotten enough of The Bard, and you want to know more about what his plays would have been like back in the day, don’t miss this delightful video about Shakespeare’s original pronunciation vs. received pronunciation. Featuring father and son David and Ben Crystal, respectively a linguist and actor, it unveils the mystery of a many a mismatched rhyme and lost pun by delving into how the words would have been pronounced originally. Adorable father-son Shakespeare nerds, Ben and David Crystal. Click through to see them in action.